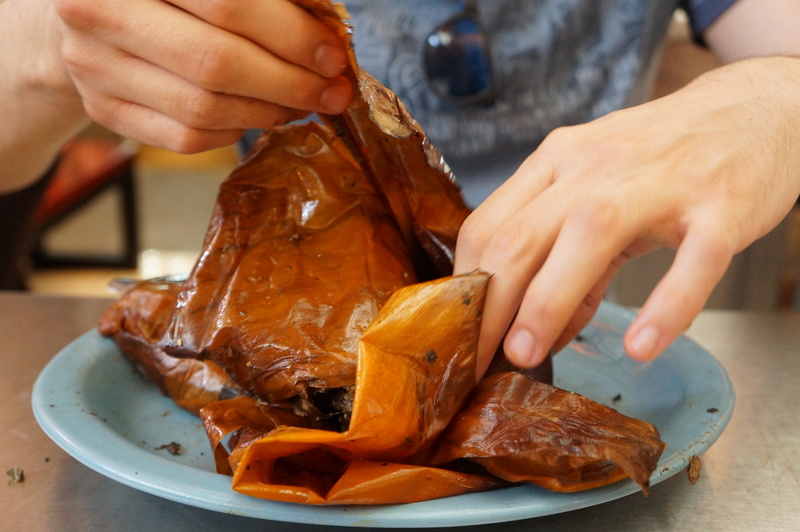 Oaxaca, a culinary paradise. – Just For Sybarites! The more I travel, the more I fall in love with my country.. not only our art, clothing, dance and music are exquisite but also and (for me) most important is the fact that we have as many cuisines as cultures. This time I had the chance to travel to Oaxaca, a state in the southeast of Mexico and what I found went beyond my wildest expectations.. Since I was a kid I always heard of the famous Oaxaca market. My father always told me I would go mad with all the smells, colors, tastes, spices.. And so I did! 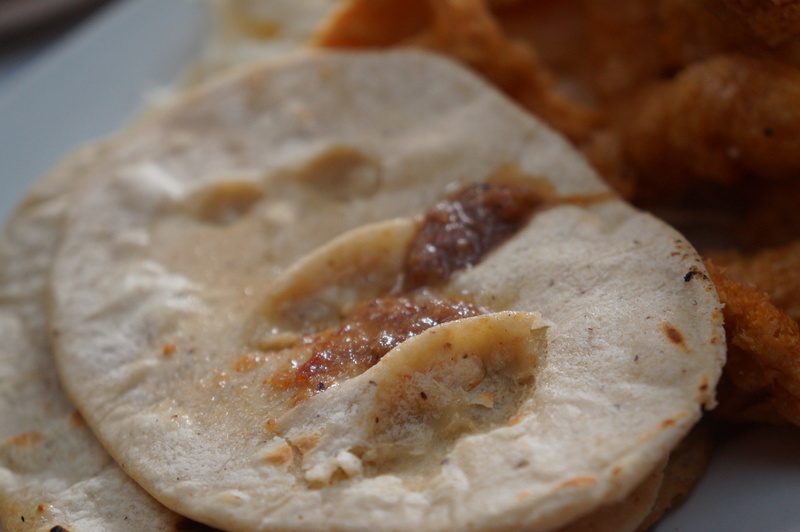 If you translate literally the name of this dish you would come up with “twins with a sit” but it actually refers to a thick type of tortilla that has on top a particularity to Oaxaca which consists on the unrefined pork lard and tiny pieces of meat that sit on the bottom of the pot when chicharrón is made (therefore the name). 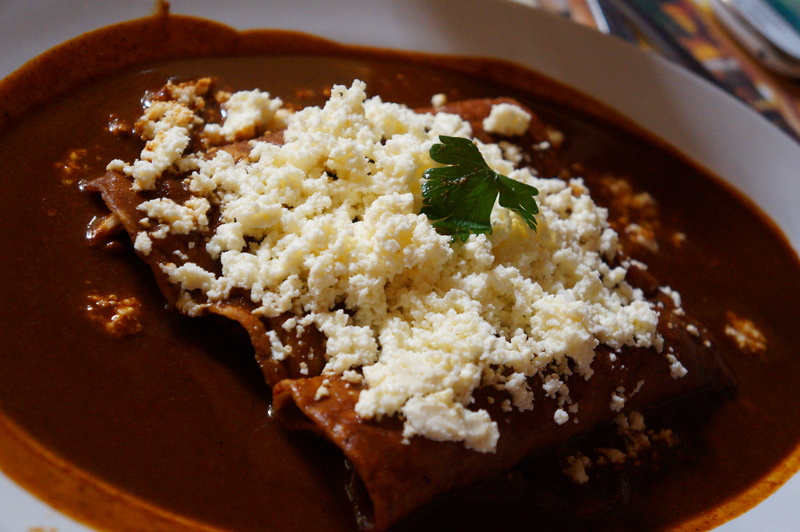 The memelas can be served on the traditional simple way or with meat, cheese, salsa and other yummy stuff on top. 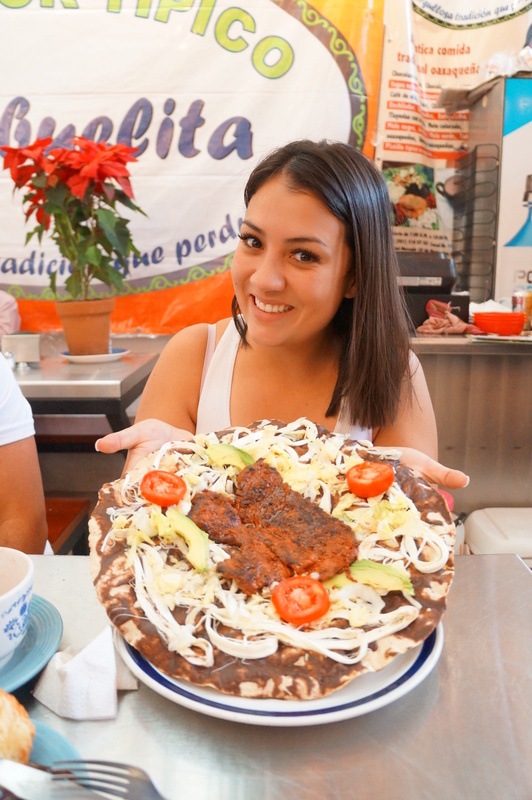 This dish consists of a large, thin tortilla (30cm diameter approx) that is set on the fire, either directly on the grill or on a comal until crispy. Then “asiento” is spread followed by refried beans, shredded lettuce, avocado, tomato and chili-encrusted pork. This may also come with “tasajo” a thin cut of beef tenderloin traditional to the area. Aka grasshoppers. 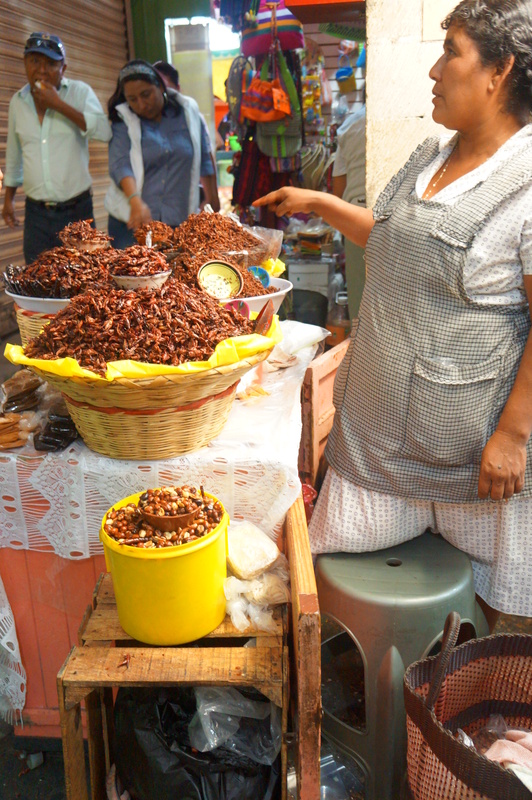 As weird as it may sound, grasshoppers are very traditional to Mexican cuisine and consumed all over the country. 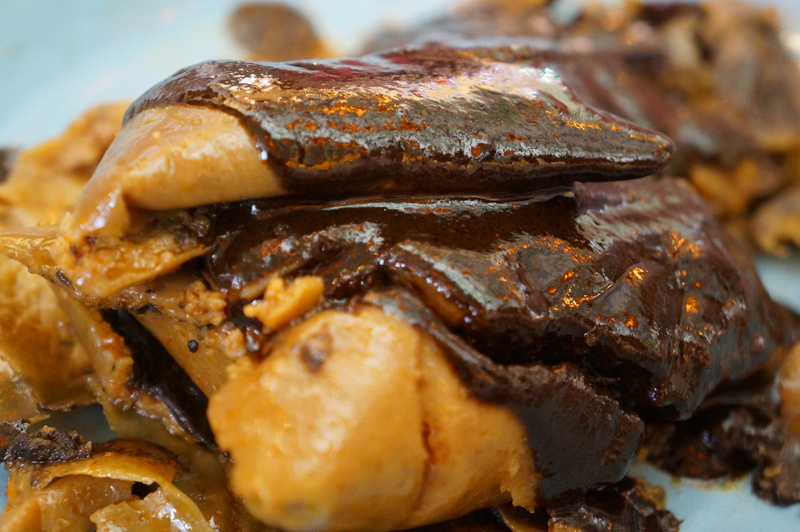 They have different sizes and flavors and definitely the place to go for this is Oaxaca. They have some that have been toasted with garlic, some tiny ones that are quite salty and can be used instead of salt, some very very spicy and so on… On top there is a maiz squared crispy tortilla with avocado puree and some tiny delicious bugs! 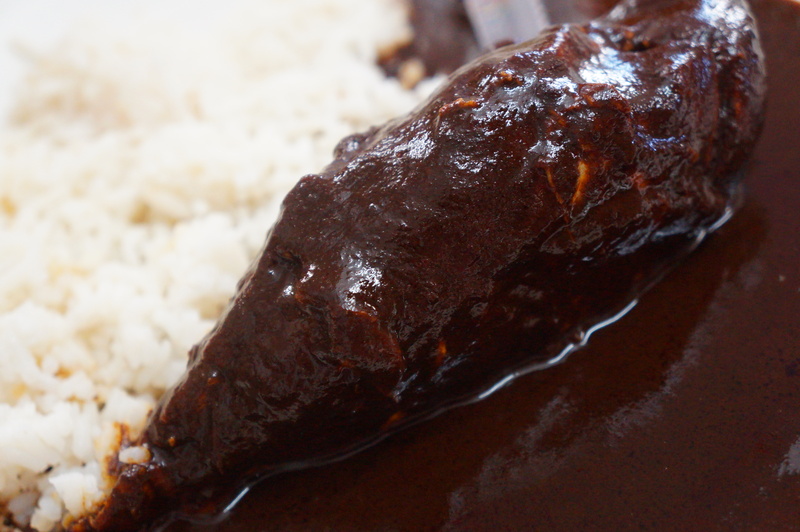 You may have heard of mole, this dark sauce that is made with spices, nuts and chocolate and it is used for several dishes… well I though I had tried great moles but the one in Oaxaca just knocked me off my feet! 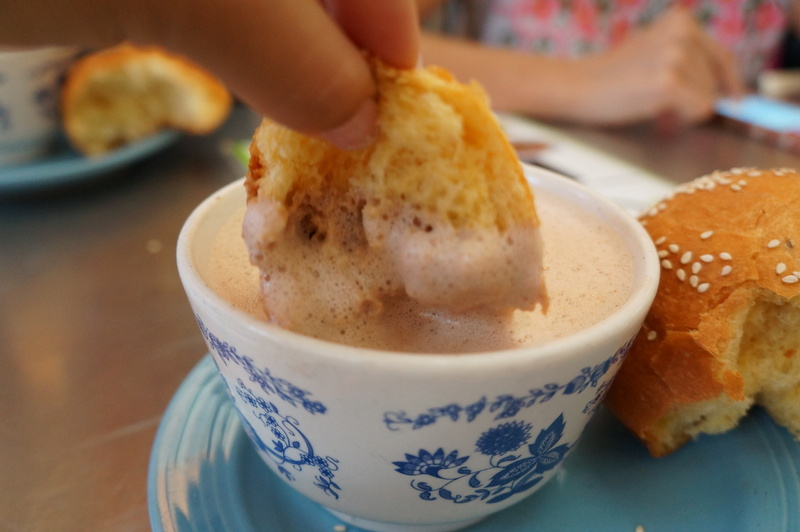 They use freshly grounded cocoa beans and chilies local to the area that you cannot find elsewhere and pieces of sweet pastries to thicken it out. Each place has their own secret and they are quite jealous of their recipes (believe me I tried to get a few). They use it for many dishes such as “drowned” sunny side up (picture above), on top of poached chicken and of course on enchiladas. Another one that is worth the trip… There are tamales in many many restaurants all over the world, in Mexico city street vendors go out at 5am to sell several flavors of them but the big difference with those in Oaxaca (apart from the glorious mole) is that they are wrapped in banana leaves (as opposed to corn leaves) and they are not always squared. The maiz dough is grounded by hand and mixed with pork lard then pieces of chicken breast are “hidden” inside and mole is added. Once closed they are steamed. Chocolate in Oaxaca is a jewel since it is very different to the chocolate we know such as Cadbury etc. The traditional chocolate is made only of mashed cocoa beans and sugar, nothing else. The aromas remain intact and thus you can imagine how glorious the hot chocolate is. Hot chocolate can be served mixed with water or mixed with milk, it’s up to preference of each person. The important part is the mixing that has to be done strictly with a “molinillo” a wooden tool that creates foam on top. 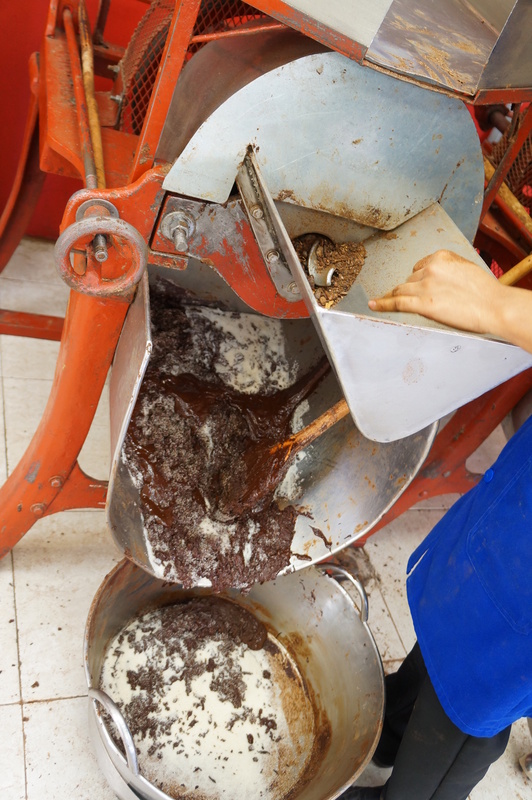 The magic of chocolate in Oaxaca is that it is made on the spot (literally) you just cross the street and watch them grind the cocoa, add the sugar and so on until it is served with a special egg yolk bread that you must dip in. Piedra means rock in spanish and piedrazo refers to the action of hitting someone with a rock thus the name to this snack since it consists on an old piece of bread (as hard as a rock) that is then soaked in pickled veggies of your choice and topped with salsa. Think of the most unusual fruits there are and you will find them on a delicious, refreshing sorbet or ice cream. 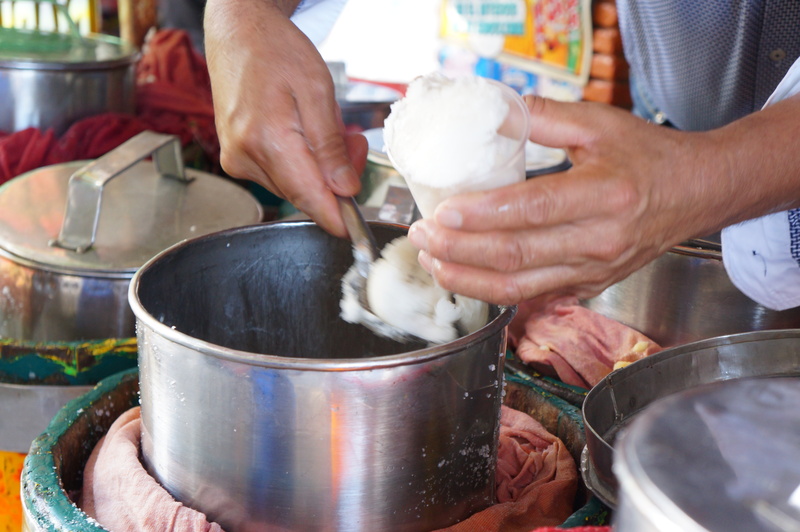 They don’t use ice cream machines nor colorants nor artificial colors, it is simply natural. The most traditional (and delicious ones) are mezcal, mamey, pricklypear, soursop and tamarind. Mezcal is the cousin of Tequila, the main difference is the agave they are made of. Mezcal is made in several states and each has a different style. Some are smokey, some herby, some very strong and some quite aromatic. 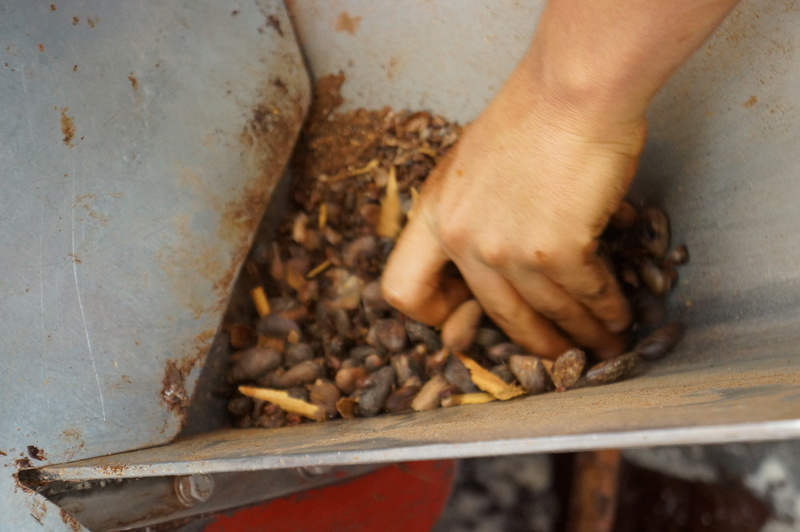 In Oaxaca you can visit the factories and actually see how the process goes, step by step. At the end of the tour you get to try the mezcal coming out of the copper still as it distills on the spot! As you can see I had a busy time during my stay! I am sure there are thousands of things I still have to try and therefore I shall be back soon! If you have the chance do not hesitate on visiting Oaxaca City, not only it is a gorgeous town that remains traditional and “undeveloped” to a certain degree (which made it more special) but also it is a culinary heaven!!! 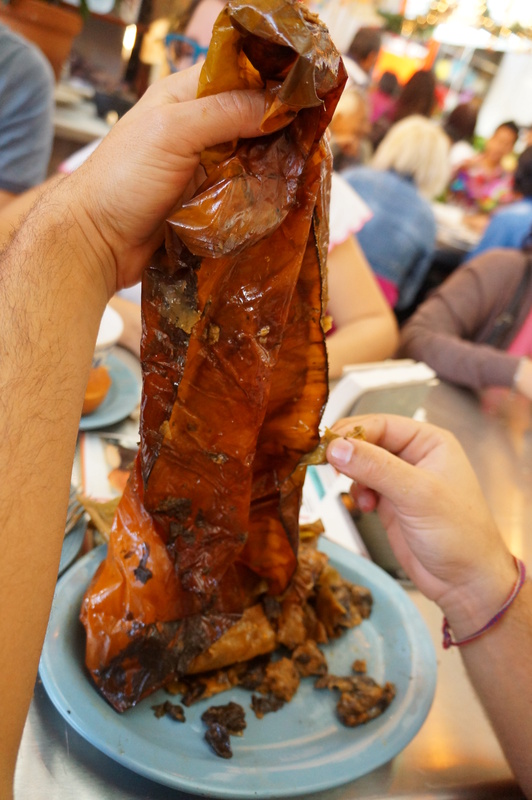 Don’t miss the next posts with recipes from Oaxaca, the process of Mezcal making and more! Previous Post We are now in Bloglovin!